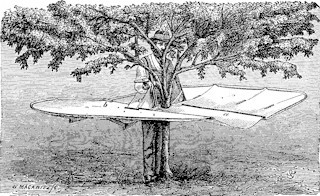 Dr. Hulls Curculio-Catcher-----This device allowed the person to stay close to the tree and use a hatchet, rubber mallet, hammer, or some type of screw or spike device to knock the insects out of the tree. The round canvas laid out under the tree would catch the insects as they fell. After the insects were knocked out of the tree they would be picked up and crushed between two fingers or placed in a bottle of alcohol until they perished. 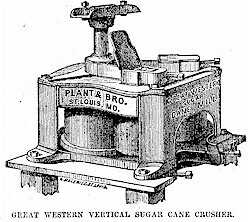 Great Western Sugar Cane Crusher----This machine was made with the cog-gearing very heavy and with two clutches on each corresponding with the other two clutches on each roller. The step boxes were provided with oil chambers which held nearly half a pint, were constructed to prevent oil from getting into the juice. The gear wheels were at the top of the rollers instead of the bottom, bringing them closer to the power. They were completely closed in by side plates to make it impossible for the operator to get his hand or cane into the gears. Post Driver---This was a method of driving post holes for fencing out on the prairie in 1868. Two men and a span of mules could drive three-fourths of a mile of posts in a day. They would hitch up the mules and they would pull the machine on the runners in the direction the fence would be going. “The working will be readily understood. A chain is fastened to the front cross piece at the points where the top pieces are joined, to which the whiffletrees are hooked. 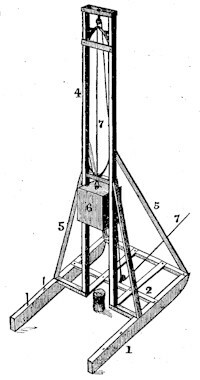 It is then drawn forward by a span of horses or mules until the weight is over the mark for the post.” It would take one to three hits of the weight or block to drive the post to its proper depth. The whole cost of the machine was approximately $25. Blister and Potato Beetle Killers ----These pincers were constructed of two pieces of wood, a screw, and two small strips of leather. 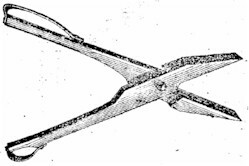 The pincers were used to “crush them on the spot” one by one. 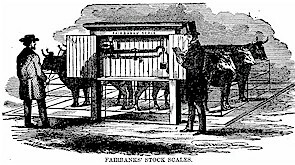 Fairbanks’ Stock Scales---By 1871 the livestock industry was beginning to make a comeback after the Civil War. This picture shows a set of livestock scales developed by the Fairbanks Company that worked on a weight’s and balance system for weighing livestock. This created a more accurate system for the livestock industry to use then just pure estimation from farmers. 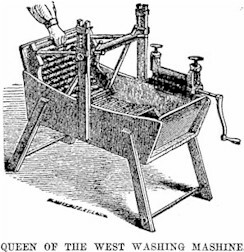 Queen of the West Washing Machine---This was a popular wash machine for the ladies of the house during 1865. It was said that “whatever facilitates and economizes the labor in the house, has its influence over the whole of the operations of the farm.” (Missouri State Board of Agriculture, First Annual Report 1865, 2nd Series). This meant that if the woman isn’t happy then the kids and the whole household will just start to fall apart. So this washing machine was developed to help momma make the laundry go quicker so she can tend to the rest of the house and the kids. This page was designed and researched by Mona Wright.